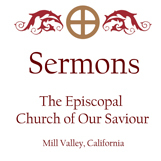 Reflections from the 2014 Easter Vigil include readings from salvation history by Nancy Cone, Kitty Hayes, and Bill Cullen, with reflections from The Rev. Annette Rankin, Br. William Carl Van Doren, and The Rev. Dr. Leslie Veen.